Today is the last day of PHE’s and the Department of Health’s Week of Action: Giving Every Child the Best Start in Life. An ideal time therefore to bring a comprehensive new tool which aims to help improve healthcare in England to the attention of health professionals working with children and young people. The Atlas of Variation in Healthcare. Provision of healthcare varies across the country. It isn’t necessarily always a bad thing, some variations in healthcare can be linked to differences in levels of illness, or patient preference.. However some variation is what we call “unwarranted” – in that it can’t be explained by these same reasons. It could be due to limited professional knowledge or disparate organisational performance, for example. While some patients are missing out on the right care, others are being given care they don’t need. This Atlas, in a nutshell, shows us that if we can address variation at local level and the more effective practices seen in some areas of the country are adopted by others, there is significant potential to save lives, diagnose ill-health sooner and prevent emergency hospital admissions. Ensuring every child has the best start in life is a PHE priority. Prevention and health improvement must take place from the very beginning to give every child the best possible chance of a healthy life. Everyone has a role to play to make sure this happens, including commissioners, service providers and health care professionals. This is where the Atlas of Variation comes in handy. There is increasing concern in the field about the mental health of children and young people. 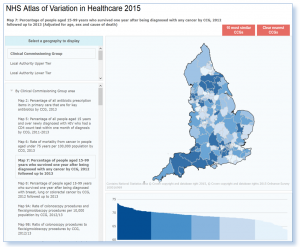 The Atlas presents two maps which relate to self-harm, and the rate of children and young people who have three or more hospital admissions per year. Map 86 on child admissions to hospital for mental ill health (by CCG, 2012-13) tells us that 10% of 5 to 16-year-olds have a mental health disorder diagnosed at some point in childhood. Some areas have five times as many children with 3 or more admissions to hospital per year than others. Possible reasons for the variation include the organisation, level of provision and extent of local outpatient services and facilities, and/or mental health problems in children and young people are diagnosed. These numbers are especially significant because many of these children then go on to develop a mental health disorder in adulthood. Half of the adults who will be diagnosed with mental illness will have shown symptoms by 14 years of age. So how do we reduce this variation and reduce admissions? Options include ensuring service providers consider the provision of outpatient or outreach services for vulnerable groups. Commissioners also need to specify that service providers, including clinicians, review local data for case-mix, duration of treatment and outcomes, and plan inpatient and outpatient services accordingly. Type 1 diabetes is a chronic condition that affects the children young people that suffer from it dramatically. It requires effective management from both the patient and health services if complications now and later in life are to be avoided. A good indicator of whether it is being well managed is the patient’s blood glucose level. Map 82 in the Atlas shows there is a fivefold variation in proportion of diabetic children and young people with high blood glucose between the areas with the lowest and the highest. Some of this might be down to the ethnic make-up of areas or levels of deprivation but that alone cannot explain the large levels of variation. Other possible reasons include differences in the nature of care provided at individual paediatric diabetes units and the way in which units provide education about the condition to children and young people and their families. This highlights the importance of commissioners ensuring services are targeted at at-risk groups and are in line with NICE best practice; that patients have access to the latest technological treatments; and services are best equipped to educate children and young people about the importance of managing their condition. The Atlas’ potential to empower people across the health service from commissioning down to help children achieve the best start in life is immense and I urge anyone with a stake in this to open it up and see what you can learn.